Plans for 320 new homes on the southern edge of Haywards Heath have been approved despite concerns developers are ‘ripping up the countryside’. 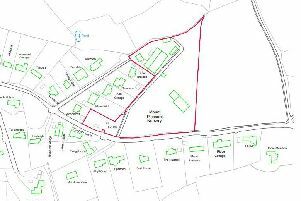 Outline planning permission was granted for land south of Rocky Lane by Mid Sussex District Council’s District Planning Committee last night (Thursday March 16). Concerns were raised about the impact of extra traffic and the impact of new homes on the ancient woodland, with 53 letters of objection received. He described the disappointment that the Woodland Trust’s recommendation’s had been ‘totally ignored’. suggesting the application represented ‘ripping up the countryside’. Officers explained that parts of the site were in both the emerging Mid Sussex district plan and the approved Haywards Heath neighbourhood plan. The scheme includes 30 per cent affordable housing and a right turn priority junction into the development. Tim Rodway, acting as agent for the developer, described how the scheme offered ‘significant benefits’ to the district and the local area, and would be ‘attractive, well-laid out and sensitive to local circumstances’. Phillip Coote (Con, Crawley Down and Turners Hill) said it would be ‘very difficult’ to argue against the scheme since it was in the town’s neighbourhood plan, but questioned the amount of extra traffic and described being ‘disturbed’ by Southern Water’s comments about not being able to ‘cope’ with the new houses. County council highways officers said that the new traffic would not have a significant impact on the A272, prompting laughter in the public gallery. A survey had been carried out for Rocky Lane indicating average speeds of around 34 to 35 miles per hour. Councillors were told that the buffer space between the new homes would be agreed at the reserved matters stage, while Southern Water had a statutory obligation to serve any new properties. Robert Salisbury (Con, Cuckfield), chairman of the committee, explained that the scheme had large constraints such as the ancient woodland and hedgerows. Meanwhile officers described the need to ‘make sure development fits into the local environment as best we can’. Afterwards several residents in the gallery muttered ‘shame on you’.